Capt. Moses Bautista had entered his 19-foot skiff, the IWA LANI, in the Wee Guys Tournament on this day. They hooked the marlin and boated it 21/2 hours later. 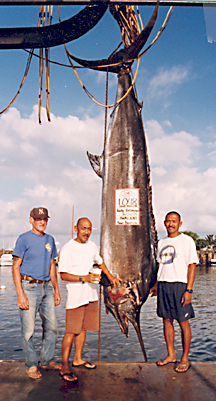 Unfortunately, the fish was disqualified due to its stomach blowing out when they towed it in without tying the marlin's mouth shut. It was the first grander for Kona in 1999.